Take the time to enjoy an exotic experience, adventurous tales, and responsible travelling in Nepal. Nepal is filled with untapped destinations, unexplored adventures, and a very diverse terrain. Aside from being bestowed with natural beauties, it is also known for its rich culture, heritage, and diversity. Travelling within Nepal will challenge and change you and leave a mark in your memory and your heart! During this tour, you will be accommodated in deluxe hotels based on twin sharing basis. You will have your airport pick up at Kathmandu, hotel check-in, admin works, and then, a brief meeting. You will ride from Kathmandu to Chitwan National Park and then you will stay in a hotel at the national park. You will have national park activities such as elephant back safari, jungle walk, crocodile breeding center, cannoning, and crocodile watching. You will stay at the hotel in the national park. You will ride to Lumbini which is the birthplace of Buddha. There, you will have a Buddha circuit tour and then a hotel stay at Lumbini. You will ride to Pokhara via Tansen hill which is an ancient hill town. You will have a hotel stay at Pokhara. You will have activities at Pokhara including cave exploration, Davis falls, boating at Fewa lake, lakeside ride, and evening free time around the lakeside. You will stay at a hotel in Pokhara. You will have more activities at Pokhara including bungee jumping, zip line, paragliding, and evening free time. You will ride to Kathmandu, check into the hotel, and then have a spa and massage session. You will sightsee in Bhaktapaur, Patan, Monkey temple, and Pashupatinath temple. In the evening, you will have a typical Nepali dinner. You will pack up for your airport drop. Ram Krishna has ridden through all the motor-able roads including highways and extreme off-roads of Nepal in his 20 years of motorcycling experience. He is an experienced Royal Enfield motorcyclist and has taken number of riders to the major highways and off-roads of Nepal. Nepal is filled with untapped destinations, unexplored adventures, and a very diverse terrain. Along with being bestowed with natural beauties, it also is known for its rich culture, heritage, and diversity. Himalayan Roads Nepal believes that traveling within Nepal will challenge and change you and leave a mark in your memory and your heart. 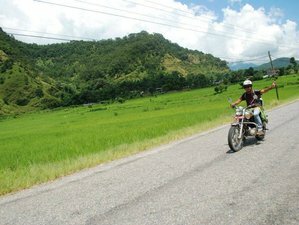 During this tour, you will find yourself riding through Kathmandu, Chitwan, Lumbini, and Pokhara. The price of the package includes daily breakfast, lunch, and dinner. You will be served with Nepali lunch and dinner and choices of breakfast. Please book your flights to arrive at Tribhuvan International Airport (KTM). Transfer from and to this airport is available on request. Himalayan Roads Nepal provides guided motorcycling tours (plus trekking) around the high Himalayas of Nepal on 350cc and 411cc Royal Enfield motorcycles.